I am Serving in my Ward as the Activity Day Leader, but this as well as other post I have can certainly be used for FHE, YW, YM, and just plain for fun. I just hope that this will help someone else to magnify your callings too. I found a lesson in Gospel Principles Manual that was going to be perfect for us to help teach the idea about how developing our talents will serve our Heavenly Father. We all have special gifts, talents, and abilities given to us by our Heavenly Father. When we were born, we brought these gifts, talents, and abilities with us. The prophet Moses was a great leader, but he needed Aaron, his brother, to help as a spokesman (Exodus 4:14–16). Some of us are leaders like Moses or good speakers like Aaron. Some of us can sing well or play an instrument. Others of us may be good in sports or able to work well with our hands. Other talents we might have are understanding others, patience, cheerfulness, or the ability to teach others. We have a responsibility to develop the talents we have been given. Sometimes we think we do not have many talents or that other people have been blessed with more abilities than we possess. Sometimes we do not use our talents because we are afraid that we might fail or be criticized by others. 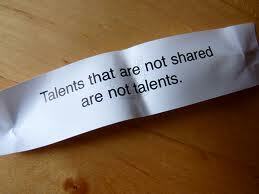 We should not hide our talents. We should use them. Then others can see our good works and glorify our Heavenly Father (see Matthew 5:16). We also Talked about how we should appreciate other peoples talents, and how we can develop our own talents by learning from others. Here was a cute Matt and Mandy Developing Talents Episode we shared in class. When we use our talents we are promised blessings- we will have an increase in our talents, and be blessed. I found this fun video on you tube and showed it to my group… Its about two missionaries that share their talents and the gospel. It teaches that all our talents that we have or are developing, that we must use them to build up the kingdom of God. To share our talents, to use our gifts to share the gospel and to bring people unto Christ. We called the Primary Chorister to ask her if our Activities Day group could help her plan and teach a song to the Primary during singing time. She was so willing to participate. We chose to learn the ASL to Families can be Together Forever. For some reason I could not view either on my iPad… so if you are still needing another version (American Sign language)- you should chose which works the best for your tablet, computer, group or family. Now we plan to teach it to our Senior and Junior Primary group. It will be a lot of work but the girls seem to like a fun challenge. We will do this till they have their Primary Program later this year. During our after school activity class time (if that’s what you want to call it) we will work on learning the sign language, make a little chart to help us remember what signs come when and then practice and practice. Brenda submitted this handout that comes straight from the manual. 1 page, 8.5 x 11 inches, black and white. This is a great worksheet to let each girl see how many talents she has. So often we hear “I don’t have any talents.” Not all talents are the same and many aren’t even thought of as talents when in reality there truly are. This worksheet helps the girls see theirs.